Heat the oven 180ºC/gas 4. Line 2 large baking trays with baking paper. Weigh out all the dry ingredients and very roughly chop the chocolate, pistachios and cranberries into chunks. Put the flour, cocoa, sugar, half of the chocolate, baking powder and ½ teaspoon of sea salt into a food processor. Pulse until the mixture resembles fine crumbs. Beat together and add the eggs and vanilla and pulse until the dough just comes together. Tip onto a floured surface, add the pistachios and cranberries and work the dough to a ball. Divide the dough into 2 pieces and shape each piece into a log approximately 3cm x 30cm. Carefully transfer the dough logs onto one of the baking trays and bake for 25 minutes, until hard on the outside but not all the way through – this will allow you to slice the biscotti without the log crumbling. Leave to cool in the tin. With a serrated knife, cut the biscotti diagonally into 1.5cm-thick slices. Arrange the slices on the baking sheets and bake for 15 to 20 minutes, until firm. The biscuits may still seem a little soft but they will firm up as they cool. Melt the remaining chocolate in a bowl over a pan of gently simmering water. 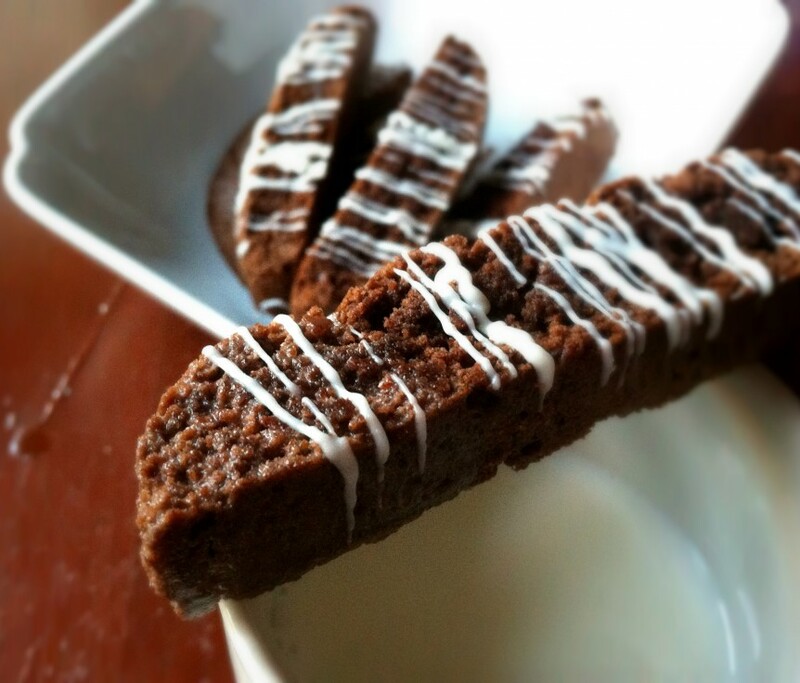 Drizzle it over the biscotti and leave for about 20 minutes to set. These will keep in an airtight container for a few days.